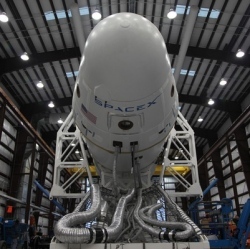 SpaceX conducted a test flight of a three engine version of the F9R test vehicle. During the flight, an anomaly was detected in the vehicle and the flight termination system automatically terminated the mission. Throughout the test and subsequent flight termination, the vehicle remained in the designated flight area. There were no injuries or near injuries. With research and development projects, detecting vehicle anomalies during the testing is the purpose of the program. Today’s test was particularly complex, pushing the limits of the vehicle further than any previous test. As is our practice, the company will be reviewing the flight record details to learn more about the performance of the vehicle prior to our next test. SpaceX will provide another update when the flight data has been fully analyzed.